The response to the Encounter Table's first Spotlight article has been overwhelmingly positive. You may notice now that there is a disclaimer at the bottom of the site detailing the Encounter Table's compliance with Paizo's Community Use guidelines. If you're interested in developing your own blog like the Encounter Table and using Paizo's intellectual property, I highly recommend checking out the links there. I was also reminded by Paris Crenshaw, organizer of the Wayfinder Fanzine that issue #11, due to come out in July (in time for Paizocon) will feature a bevy of information about Cheliax designed by fans, for fans. If you enjoyed our spotlight on Senara, I highly recommend you check out Wayfinder! Today, the Encounter Table's serialized fiction continues with Part IV of Tyranny of the Stars, advancing the story of adventurers in the dangerous Mana Wastes and the wasteland city of Alkenstar. Also, in today's Between the Lines article at the end of the story, we unveil the drunken gunslinger archetype. 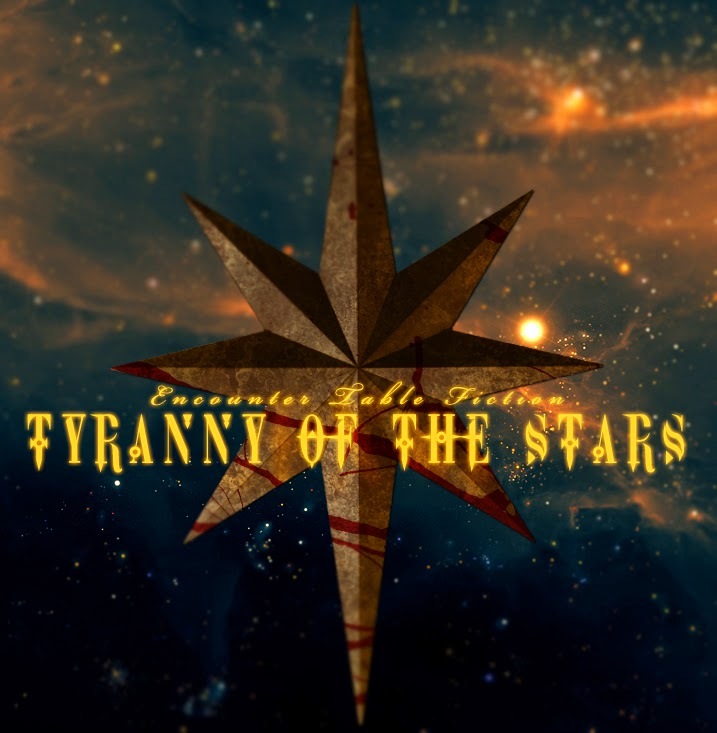 Let us know what you think about Tyranny of the Stars and the drunken gunslinger archetype in the comments section! A shingle hanging outside of a battered storefront in the ash-dusted streets depicts a cat walking on an iron fence while stalking a mouse. The name "Stalker's Fence" is written below in gold script. A sparrow, too, rests atop the sign. The bird isn't part of the sign itself, but rather a feathered visitor covered in a thin shroud of ash. The tiny bird flutters, picks at its pinions with its beak, then alights into the air as a lone traveler makes his way down the street. At this hour of evening, when the sun is a greasy spot of light over the western mountains, barely visible through the smog, the shadows are long and gas-lamp light paints the ashy streets a jaundiced hue. The traveler pauses, looks up the sky, thoughtfully, then turns towards the tavern. Inside, the noise of creaking hinges is drowned out by the din of piano playing, and much conversation. The saloon doors swing back and forth slowly, letting narrow shafts of diffuse gray light and a lone traveler spill in from the street outside. The particles of ash caught in the light swirl around the man walking through those doors, and the heavy report of his boots on the hardwood floor is likewise swallowed up by the noise. When patrons of the bar spot him, their backs tense and posture straightens, eyes square on his tall frame but only a few make eye contact. Most are focused on the double-barreled shotgun folded casually over one arm. "Clear skies," the gunslinger requests as he reaches the bar, settling down onto an old leather-topped stool. He flings the tail of his duster out from under himself as the bartender responds wordlessly, briskly mixing a drink of cloudy, pickled juice from a jar with clear liquor from a top-shelf bottle. The resulting concoction looks like parting clouds revealing a crystal clear sky in a tall glass. He charges nothing. "It's important that I find him," is overheard by the gunslinger, coming from an out of place stranger down the bar. "I was told that Jezidah frequented this establishment." The gunslinger's cold gray eyes lift up from his drink, watching a dark-haired Chelish woman dressed in the ruffled finery of a noble press a few gold coins onto the bar-top beside a grimy, dwarven patron. The dwarf scrutinizes the coinage, then shakes his head. "Told ya," he grunts, "ain't seen Jezidah in months. Might be out on contract, lots a'heads needin' huntin' that ain't gonna' hunt themselves." The coins are pushed back towards the noblewoman, all while the gunslinger watches quietly, intently. "If you remember anything," she pushes the coins back across the bar again, "consider it a cash advance on services to be rendered. If you see him, tell him Korva Hightower is looking to hire him—long term—for something in his line of expertise. He'll know how to find me." When Korva moves to leave, with the coins in eye-shot of the gruff dwarf, the gunslinger slides off of his stool, leaving both rifle and drink behind. A few heavy footfalls is all it takes for the gunslinger to intercept Korva's departure, and the sight of a gray-haired old man in an ash-speckled duster approaching gives her a moment of pause. "I'll take yer' coin," the gunslinger drawls out with a motion of his head towards the bar. "I know where the feller' you're lookin' fer's gone off to." Hesitating, Korva glances back at the money she left with the dwarf, and keeps up appearances by gesturing for she and the gunslinger to step aside from the noisy bar, motioning towards an empty booth lit by a ensconced candle on the table. Tired, gray eyes follow her gesture, and a wordless nod acknowledges the request as the gunslinger falls in stride with the noblewoman. Seated now across the table from Korva, the gunslinger takes an opportunity to withdraw a thick cigar from within his jacket, rolling it between calloused fingers before slicing the end off with a folding knife. "You're a long way from Westcrown," is more telling a comment than Korva first realizes; it isn't a lucky guess. "What brings you here, lookin' fer' Jezidah?" "Business," she obliquely explains, her hands spreading apart in as wide a gesture as her explanation is vague. "What brings a shieldmarshal to my table?" The look Korva returns to the gunslinger is a pointed one, before his laces his hands together in front of himself and relaxes. Lighting his cigar with a tindertwig, the gunslinger draws in a slow, purposeful breath. The head of the cigar glows brightly, crackling and popping before a puff of smoke is exhaled through his nose and across the bristly whiskers of his thick mustache. "Jezidah's dead," is simply put, the tindertwig waggled in the air to extinguish it. Korva's reaction is nonplussed, her brows furrowing together and posture slouching until she's reclined against the hard back of the booth's cloth-upholstered seat. Dark eyes avert from the gunslinger, down to folded hands, then angle to look into the firelight of the candle. "I take it you're certain?" "Buried 'em m'self," is delivered with the desired certainty. "Jezidah'd gone a long time thinkin' that a man can make enemies an' not have it come back n'bite 'em in the posterior." Those tired, gray eyes seem much more focused now, leveled as they are on Korva's far darker ones. "Who killed him?" Seems like an easy question to answer. "I did," the gunslinger clarifies. "Right 'fore I turned in m'badge." It's this later detail that Korva had needed to quell her uncertainty. Silence hangs at the table for a moment, before Korva finds her posture again and leans forward to more directly engage the gunslinger in conversation. "That's an unusual choice for someone of your station," Korva opines with the barest hint of an appreciative smile creeping up on her lips. "But, I'm not one to question a man's choices, that's for powers beyond us to weigh. I'm one to make offers." The gunslinger raises a single, gray brow at the insinuation, then withdraws the cigar from his mouth between pinched fingers. Motioning with that hand, a trail of smoke is drawn between he and Korva. "I ain't a mercenary." It's direct, but Korva has navigated these conversational waters before, elsewhere. "Never implied. But, a man must earn a living, and I have opportunity, if you'll listen." "Shoot," has a couple of meanings to infer, coming from an ex-shieldmarshal. Korva takes the most favorable interpretation for the time being. Instead of jumping right in to a sales pitch, she reaches inside of her leather surcoat and withdraws a cloth-wrapped object. Set down on the table it has an audible weight to it. Delicately, the cloth is pulled back, and the gunslinger's attention remains fixed on it. Piece by piece, an object is revealed: A bright and pale metal, like blanched steel, forged into a solid hemisphere. Banded engravings on its surface, inlaid with gold, are unrecognizable to the gunslinger as are the diamond-studded constellation patterns on the dome's crown. Assured now that he has the gunslinger's attention, Korva half-heartedly covers the object with a flap of cloth. Their eyes meet, and this time the noblewoman has the advantage of curiosity—whether to her intentions or her work is uncertain; the distinction doesn't matter, only the presence thereof. "Before we continue," Korva reaches out across the table. "Korva Hightower." "Iosef Hollows," the gunslinger replies, taking Korva's hand with a firm shake. "I ain't an appraiser, neither," is added with the barest hint of wistful humor. "Also, not implied." Korva leans back against the cushion again, leaving the curiosity between them on the table, partly covered. "I'm looking for security," she explains. "I'm funding an exploratory expedition into the Mana Wastes, in search of a ruin from the great war. I need a head of security for the team who knows the lay of the land. I'd originally hoped to hire the departed Jezidah, but now..." she motions to Iosef, "I suppose new opportunities present themselves." Grumbling, Iosef wordlessly gets up from his seat. The motion startles Korva, who looks with bewilderment at the gunslinger's departure. But just as she attempts to regain his interest, she realizes that Iosef's trajectory isn't towards the door, but rather where he left his shotgun and drink. Exhaling a sigh of relief, she gives the gunslinger time to retrieve his belongings and return to the table. Then, it's Iosef who initiates conversation, settling his cloudy glass down on the table. "Have you ever looked up at the night's sky, and wondered?" Korva's question elicits little response from the old gunslinger at first, save for a scrutinizing stare. "Wondered what?" He finally asks. Korva's smile becomes more apparent, and she leans in closer over the table, as if she were imparting a secret of great importance. "Have you ever wondered if the stars were looking back?" Some gunslingers rely on a rugged sense of determination and duty to drive them through their battles. Others yet command a sense of charm and swagger that lends an air of mystery about them. But some gunslingers get by on a full tankard of ale and a wobbling swagger all their own. While few in number, those who have taken to the bottle and the bullet and come out stronger on the other side are a sight to behold. Drunken Grit (Ex) At 1st level, a drunken gunslinger can drink a tankard of ale or strong alcohol and gain one point of grit. The act of drinking is a standard action that does not provoke attacks of opportunity. The gunslinger can gain a maximum number of drunken grit points equal to 1 plus one additional point for every three levels thereafter (4th, 7th, and so on). These drunken grit points last for 1 hour or until spent, whichever is shorter. As long as he has at least 1 drunken grit point, the gunslinger can spend 1 point of drunken grit as a swift action to move 5 feet without provoking attacks of opportunity. The gunslinger only recovers grit by drinking. A drunken gunslinger gains access to a handful of unique deeds that replace some of the standard gunslinger deeds. Wobbling Shot: At 7th level, a drunken gunslinger can spend 1 point of drunken grit as a swift action to roll twice on an attack roll and choose the higher of the two results. At 12th level, the gunslinger may spend 2 drunken grit points to roll three times on an attack roll. At 17th level, the gunslinger may spend 4 drunken grit points to gain the benefit of true strike instead of rolling multiple times on the attack roll. This deed replaces dead shot. Rain of Fire (Su) At 11th level, as a full-round action a drunken gunslinger can hurl a bottle of alchemist's fire into the air out to a maximum distance of thirty feet and cause it to explode with a single shot from a firearm. The explosion creates a column of fire ten feet high and ten feet wide that inflicts 2d6 points of fire damage. A successful Reflex saving throw (DC 10 + 1/2 the gunslinger's level + the gunslinger’s Wis modifier) halves the damage. Using this ability costs 1 point of grit, and a drunken gunslinger may opt to spend additional grit to increase the damage by +2d6 for every additional point expended. The gunslinger must be wielding a loaded firearm to use this ability. This ability replaces bleeding shot. Drunken Courage: At 11th level, a drunken gunslinger may spend 1 point of drunken grit to become immune to fear effects for 1 hour. This deed replaces expert loading. Firewater (Su) At 2nd level a drunken gunslinger can imbibe the most volatile chemicals—and survive—in order to get drunk. The gunslinger may consume a flask of alchemist fire instead of alcohol to fuel his drunken grit. In addition, the drunken gunslinger gains a +1 bonus on Fortitude saves against effects that would nauseate, poison, or sicken her, as well as saves to avoid addiction or other ill effects associated with consuming alcohol. This bonus increases by +1 for every four levels beyond 2nd (to a maximum of +5 at 20th level).